The Chennai Super Kings are coming off another victory at home against the Kings XI Punjab where the spinners bowled really well to help them win the game. Faf Du Plessis coming back and scoring runs would be a big positive for them. The Kolkata Knight Riders on the other hand, are coming off a very convincing victory against the Rajasthan Royals, which would give them immense confidence as a unit, since it was the first game they have won without Russell’s contribution. Dinesh Karthik will be really looking forward to playing at his home ground and will be eager to get a win there. Out of the 18 matches played between the two teams, The Chennai Super Kings have won 11 matches and the Kolkata Knight Riders have won 7. At Chennai, the Super Kings have dominated winning 6 out of the 8 matches played. Suresh Raina, for the Chennai Super Kings, is an important player but hasn’t got going in this year’s IPL so far. He will be looking at turning things around sooner rather than later as his performances have a great impact on the Super Kings success. Sunil Narine, for the Kolkata Knight Riders, had a very good game against the Rajasthan Royals where he scored a quick 47 and bowled an economical spell. He will fancy the Chennai Super Kings bowling attack as they lack genuine pace which is what troubles him. He will also enjoy bowling on this pitch which will help the spinners. The Chennai Super Kings are expected to play with the same team. The Kolkata Knight Riders will look to go unchanged as well after their clinical performance. The Pitch at Chennai has gotten much better since the first game, but still will assist spinners. The Chennai Super Kings who have won 15 out of the last 16 matches at Chennai, will definitely start as favorites to win the game. They will miss the experience of Bravo in the death overs which is a weakness for the Super Kings. Having said that, the Kolkata Knight Riders have been playing really well and have all bases covered. If any team have to win the Super Kings in their own backyard, it has to be the Knight Riders at the moment. Both teams, should look to chase to win the game. The Chennai Super Kings are great at chasing down scores and don’t have a very good bowling attack to defend a total. 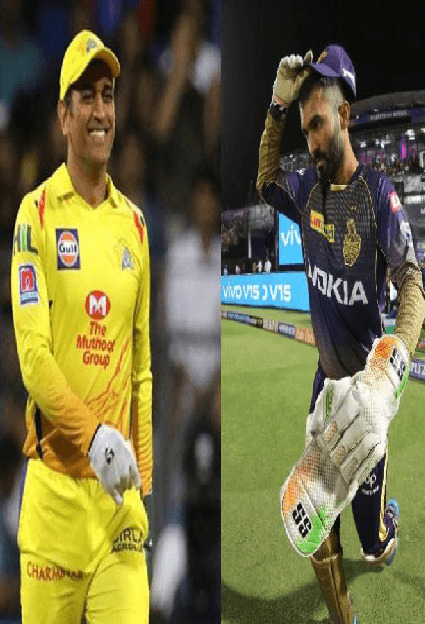 The Knight Riders as well, with the power at the top, as well as having Russell down the order, will be able to chase down any total, particularly against the Chennai Super Kings bowling attack. The Chennai Super Kings will have to find a way to stop Narine from getting off to a flyer early on and should get Russell out early. Deepak Chahar who can swing the ball at the top can be a good option against Narine who is much more comfortable against spinners. Tahir has to be the bowler who can trouble Russell. The Kolkata Knight Riders will know that the Chennai Super Kings are normally slow starters but go extremely hard at the death overs. Hence they have to get wickets early to set them back which will delay their final onslaught.